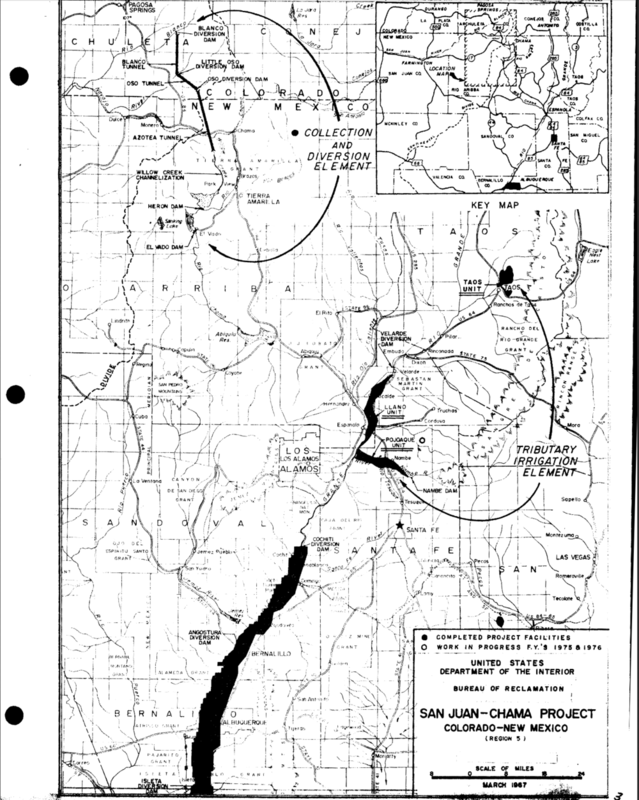 The San Juan – Chama Project was proposed as a way to deliver water to inhabitants in Southern New Mexico and on June 13, 1962 Congress passed the Public Law 87-483 which was then signed by President John F. Kennedy. Public Law 87-483 was implemented as an amendment to the Colorado River Storage Act of 1956 (CRS) and allowed for the diversion of water, from the natural flow in the Colorado River, into the Rio Grande Basin. While multiple phases of this project were proposed only Phase One was actualized and that phase is the San Juan – Chama Project that transports the diverted water and annual storage capacity of 110,000 acres per foot (ac-ft). Annually, there is approximately 96,200 ac-ft that is diverted and contractually reserved for various cities and tribes. Public Law 87-483 also stipulates that the volume of water diverted cannot exceed 270,000 ac-ft per year or 1,350,000 ac-ft over a ten-year span. Since construction on the diversions and tunnels were finished, many projects have been conducted on the water in the San Juan - Chama region. Most projects have centered on the water quality and the supply. Falk, Sarah E., et al. Water Quality, Streamflow Conditions, and Annual Flow-Duration Curves for Streams of the SanJuan - Chama Project, Souther Colorado and Northern New Mexico, 1935-2010. U.S. Geological Survey Scientific Investigations, May 2013. Glaser, Leah S. San Juan - Chama Project. Bureau of Reclamation. Gould, Jaci. San Juan - Chama Project Water Use. 1999. Langman, Jeff B., and Scott K. Anderholm. 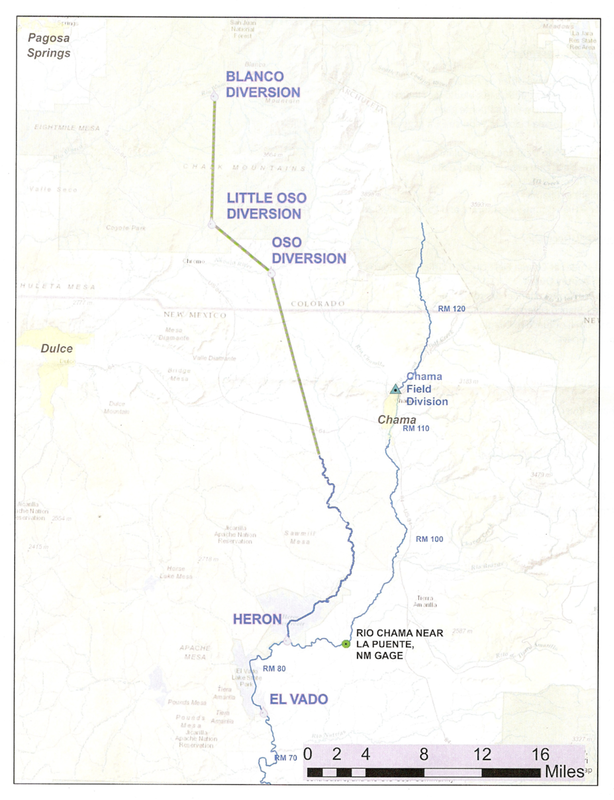 Effects of Reservoir Installation, San Juan-Chama Project Water, and Reservoir Operations on Streamflow and Water Quality in the Rio Chama and Rio Grande, Northern and Central New Mexico, 1938-2000. Project History: San Juan - Chama Project, Colorado - New Mexico. Volume XV, U.S. Department of the Interior, Bureau of Reclamation, 1977. Whipple, John. San Juan - Chama Project Water Supply. New Mexico Interstate Stream Commission, July 2007.